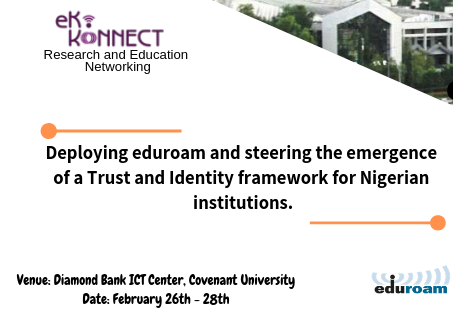 The Eko-Konnect Research and Education Initiative in collaboration with Covenant University will host an Africa Training Initiative (ATI) workshop on joining eduroam and employing hosted SAML Identity Providers from AfREN to bootstrap the emergence of a Trust and Identity framework for Nigerian institutions. The first 2 days of the hands-on workshop will be devoted to training on using WACREN Cloud and hosted eduID identity providers to deploy eduroam on campus. This will be followed on day 3 with a planned deployathon to make the Covenant University campus network eduroam-capable as a demonstrator. The eduid.africa cloud service operated by WACREN in West and Central Africa is a trusted access management environment that provides users with roaming Wi-Fi connectivity and content access whether at home or abroad, using the login credentials of their home institution. Students and researchers from participating institutions can use their home institution credentials with eduroam, the federated wireless access service that allows researchers, staff, and students to access a secure Wi-Fi network connection using their credentials at their home institution or while visiting other campuses. eduroam provides zero-effort access on global R&E networks once configured; users travelling to another institution that uses eduroam need only turn on their mobile device to immediately gain authenticated Internet access.